Fresh salmon seasoned with a Jamaican jerk dry rub - layer on extra if you like it spicy. 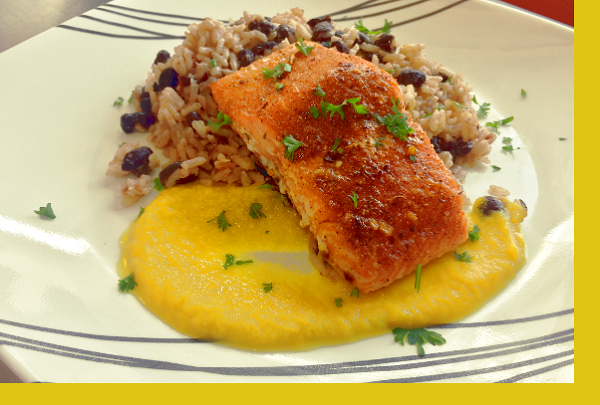 Served with Jamaican beans and rice and paired with a sweet mango orange sauce. Moist, flaky and packed with bold flavor balanced with the sweetness of sweet mango. "Irie" good! Preheat oven to 425 degrees. Place the salmon in supplied pan. Spread jerk rub over salmon - the more you put the spicier it will be. Place the salmon in the oven and bake uncovered for 20 minutes or until cooked to desired doneness. Reheat rice. Serve with mango orange sauce. We do not like salmon - never have. This is the only place we will order it from. Maria's has turned my husband into a salmon lover. The sauce on this one said it was a citrus sauce but it was more cucumber, I believe but still delicious! I've always wanted to try jerk seasoning so this was the perfect opportunity to do so. 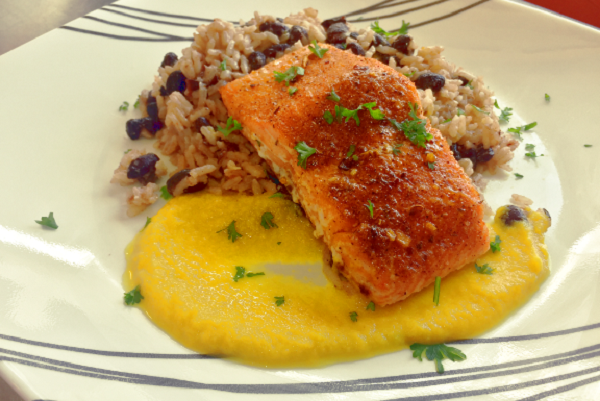 Baking the salmon with the jerk season was super simple and all I had to do was reheat the Jamaican rice and beans. I love new and exotic flavors and this was no different. It was very unique and flavorful, even though I feel like I put too much of the jerk season on the salmon thinking it would make it hotter. Loved the texture of the salmon and the easy bake instructions. The rice and beans were ok and also had a unique flavor. There was plenty of rice to last for leftovers. The mango sauce helped with the balance of flavor in the salmon but I found that I could only handle just a little. It was a little too sweet compared to the fish which was more salty. If you like exotic flavors, I definitely recommend giving it a try. Easy and flavorful dinner! My family LOVED this meal; it was quick and easy, and very tasty! We'd definitely order again.